The Ganaraska Forest is owned and managed by the Ganaraska Region Conservation Authority. In 1998 a management plan was completed for the Ganaraska Forest that provides direction in the management of the forest for 20 years. A number of objectives are identified in the plan, including the conservation and protection of the headwaters of the Ganaraska River, the protection of heritage resources in the forest, the maintenance of wildlife habitat and the provision for outdoor recreation and education. The production of wood products through the implementation of ecologically-based resource management practices will continue to be an important component of the multiple-use nature of the forest. Pine plantations, which make up approximately 50% of the Ganaraska Forest, are being converted back to natural forests through the process of selective thinning and harvesting. As these plantations are thinned and the forest canopy opens up, natural regeneration from a variety of tree species in adjacent stands occurs. By the time the final harvest of plantation trees occurs there will already be a well-established natural forest in the understory. 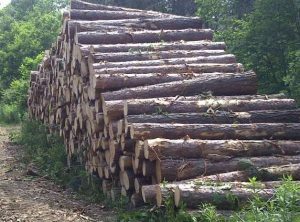 Saw logs are the most common wood product harvested from plantations with utility poles produced in more mature plantations. Some harvesting also takes place in mixed hardwood stands where selection harvesting is practised on a sustained yield basis. The frequency of harvesting in a stand is based on the growth and yield of trees within the stand. The removal of individual trees creates an opening in the canopy of the forest which encourages growth and regeneration. Forest protection areas are found throughout the Ganaraska Forest. In these areas no harvesting takes place for a number of reasons including natural heritage features, environmental sensitivity created by features such as steep slopes and water courses and education areas found close to the Ganaraska Forest Centre. Efforts are made to conduct logging operations in ways that reduce impacts on other forest uses and on the environment. Recreational users should be aware that logging activity may take place during the months of May through to November but only occurs on weekdays. Logging contractors are required to post signs on main access trails warning the public of harvesting activity in areas where active logging is taking place. Forest users should exercise caution when entering these areas or ideally avoid them entirely. Keep an eye out for signs alerting you to harvest operations. The harvests are selection thinnings and are designed to minimize impact on recreational activities and trails. All thinnings are carried out using Sustainable Forestry and Good Forest Management practices to improve the health and resilience of the stand. To learn more about forest management, contact the Ganaraska Region Conservation Authority at (905)885-8173 or info@grca.on.ca.